When i was at school admitting you liked Abba was like saying “Hey Bully-Boy, i fancy a beating”. Yes no-one would dare admit in the school playground that it was a foot tapping good song from the top pop group.A few decades later and the queen of pop Madonna has admitted that she wrote a grovelling letter to Swedish superstars Abba asking if she could sample their music on her latest single. Mamma Mia - Will Abba get more popular than the 1980s? The movie “Mamma Mia” based on Abbas music is hitting the box office and having raving reviews. Wow Abba are now getting what they deserve and even the School bully has started download “Dancing Queen” on i-tunes! It seems Abba are almost as popular today as they were in the late Seventies and early Eighties. In 2008 they really are suddenly Super Troopers in the modern world. Who would of thought that when Agnetha Faltskog bumped into Anni-Frid “Frida” Lyngstad and Benny Andersson and his best mate Bjorn Ulvaeus got together that they would become the legend they are. Abba became international superstars during the late 1970’s with a string of immaculately-crafted pop singles that, even by modern standards, seem to leap out of the speakers at the listener. Songs like “Dancing Queen,” “Waterloo” and “Winner Takes it All” encompass everything thrilling about pop music: lush vocal harmonies, bouncy melodies with catchy choruses, and hooks galore all wrapped in a big, glossy sound that never fails to thrill. This magical sound made Abba one of the most successful pop groups of all time. Simplicity is certainly there strength as the music sounds simple yet a very quick study reveals a much deeper combination of chords giving each song a hidden depth. Yet the name ABBA couldn’t be any easier. Simply put : the first letter of their first name! 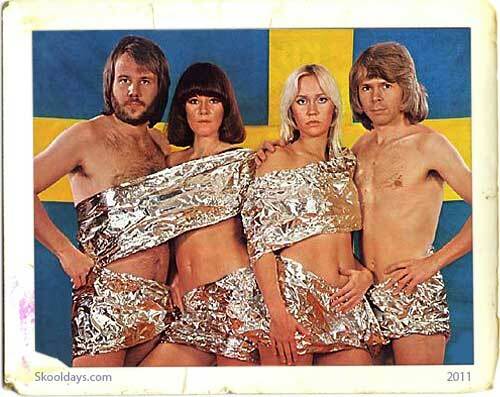 Few groups personify pop music the way Abba does. Abba earned their breakthrough in 1974 when they won the Eurovision Song Contest with “Waterloo.” This driving pop tune compared a bad relationship to Napoleon’s famous defeat and boasted a big wall-of-sound production fuelled by guitar, piano and saxophone. It became a worldwide hit and went Top-10 in the U.S. Abba followed it up in 1975 with another U.S. Top-20 hit in “S.O.S.,” an ultra-catchy tune that contrasted keyboard-led ballad verses with a powerful guitar-driven chorus. Abba also continued to build their international fan base with classics like “Mamma Mia,” a pulsating slice of pop that highlighted a unique xylophone hook on its chorus. In 1980, Abba scored a surprisingly serious Top-10 hit with “The Winner Takes It All,” a bittersweet power-ballad about the end of a romance. The heart-tugging lyrics were a direct reflection of what was going on in the group: Both couples were in the process of splitting up. Abba continued on for a few more years as they developed a sleek, synth-pop style on albums like Super Trouper and The Visitors. They continued to score worldwide hits with danceable tunes like “Gimme Gimme Gimme (A Man After Midnight).” At the end of 1982, Abba brought an amazing decade of success to a close by splitting up. Meanwhile, Abba’s classic pop continues to weave its magical spell on pop fans everywhere and has been covered by artists as diverse as U2 and Sixpence None The Richer (including an all-Abba-cover EP from Erasure). All in all, Abba’s legacy of hits and their unerring knack for melody ensure that they will always be legends of pop music. More recent times have seen even the Magic Madonna jumping on the Abba bandwagon using some great Abba backings to her recent track Hung Up. This of course takes Gimme Gimme Gimme. This is only the second time Abba have allowed another act to use their work. “I had to send my emissary to Stockholm with a letter begging them and telling them how much I love their music,” Madonna said. Songwriters Benny Andersson and Bjorn Ulvaeus have only allowed one other act to sample one of their tracks before, when the Fugees used part of The Name Of The Game on their 1996 track Rumble In The Jungle. This entry was posted in Movies, Pop Culture, PopMusic and tagged 1970, 1980 by Skooldays. Bookmark the permalink. Having just seen Abba,represented by Benny and Frida,accept the `Rock and Roll Hall of Fame` award,I`d just like to congratulate Agnetha,Benny,Bjorn and Frida on their long overdue award,richly deserved and to Fridas comment in her speech,`its too late for the group to reform,or be seen together, `my dear Frida,I know it wont happen,BUT, Never say anything is too late,if you want to do something badly enough,you can do it! Theres a lot of fans out here would love to see you all together again,maybe not singing….just together as friends. I seem to think people said Sweden would never win the `song contest`….YOU DID for Sweden.